Every new building starts from the ground up. The first step in building is pouring the foundation. The foundation is where most of the integrity of the building will lie, much like a business or a seed company. ProHarvest Seeds was founded in 2011, but its foundation began many years earlier. MWS Seeds laid the foundation for ProHarvest Seeds to build a new brand. Started in 1993 by Marlin Wilken and his sons, Lynn and Randy, MWS became well known for high quality seed. MWS Seed produced its own seed as well as sold its own soybean and corn products. In 2011, Randy and Lynn Wilken joined with veteran seedsman Keith Knapp to create the seed company ProHarvest Seeds. 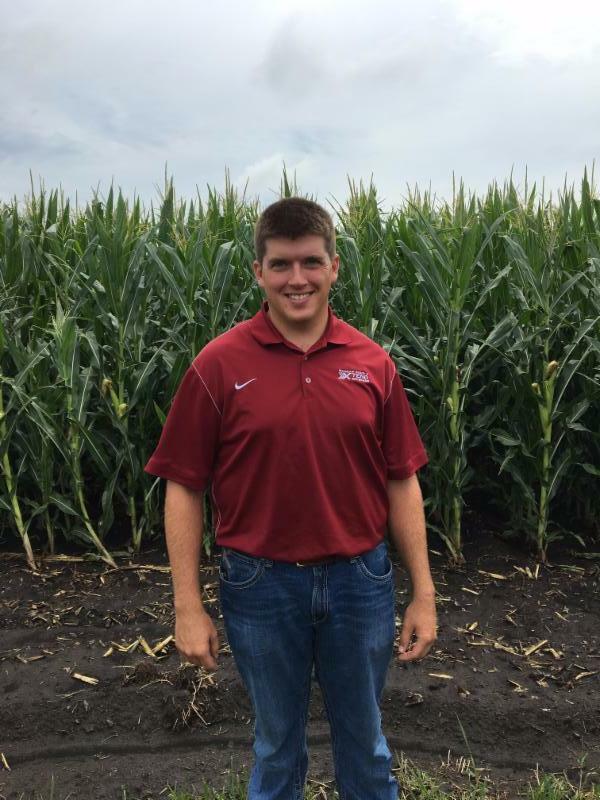 The Wilken brothers and Knapp are all second-generation seedsmen, with a strong knowledge and understanding of the seed industry. With their combined expertise, the owners began marketing an extensive and diverse lineup of corn, soybeans, wheat, forages and cover crops under the ProHarvest brand. MWS continues to operate as a seed production company and produces seed for ProHarvest and other seed markets. ProHarvest has continued to build on this foundation and has expanded its geographical footprint into 15 states throughout the Midwest. 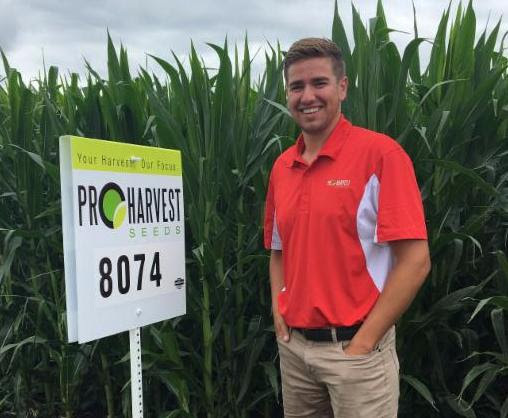 In October of 2018, ProHarvest acquired the sales and marketing rights of Moews Seed Company from Granville, IL. Moews Seed has deep roots in agriculture along with the same values that ProHarvest promotes, such as family, integrity, quality and service. ProHarvest has access to the industry’s most advanced seed genetics, trait innovations and seed treatments. As an independent seed company, ProHarvest sources its seed from multiple suppliers, creating a lineup that gives high-powered results that are fine-tuned for local geographical areas. ProHarvest reviews thousands of products each year seeking the ones with optimal performance and desirable agronomic characteristics. They combine their extensive research and testing programs with their experience and knowledge to determine what makes it into a ProHarvest Seed bag. ProHarvest continues to build on its strong foundation by focusing on what really matters: their customers. Their farming partners rely on them to help make the right decisions. Unlike larger seed companies, which have a one-size-fits-all approach, ProHarvest Seeds, takes into consideration a long list of factors when making seed recommendations. They understand the importance of climate, length of growing season, crop histories, soil types, herbicide and pesticide requirements, and more. Their products and expertise allows them to have customized choices that will produce a winning harvest for their customers. ProHarvest Seeds’ Dealers and Seed Specialists work on being with their growers throughout the entire growing season and being their trusted advisors. Providing exceptional seed and service is a core value of the company, and they deliver on that pledge. ProHarvest is not just a seed company; but delivers on its goal of being a valuable partner in their customers’ farming operation. Ashkum, IL -- ProHarvest Seeds is proud to announce it has acquired the sales and marketing rights of Moews Seed Company, effective October 2, 2018. Moews Seed Company’s main office has been in Granville, IL, since 1927. Moews Seed Company has a long and storied history, beginning with some of the early innovations and development of hybrid seed corn. Moews Seed has deep roots in the same values we promote at ProHarvest, such as family, integrity, quality and service. At ProHarvest, our forward-thinking approach to the seed industry creates opportunities for us to grow. As an independent seed company based in Illinois, our goal is to provide our dealers and growers with one of the largest selections of seed products which include traits, genetics and seed treatments. ProHarvest welcomes the following individuals to our sales staff. 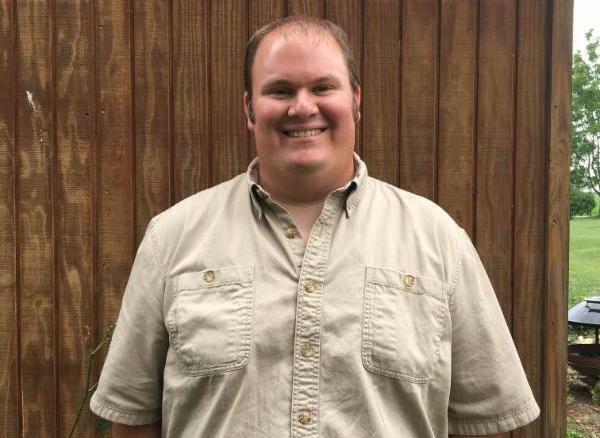 Trent Geistlinger from Beatrice, NE will be our Western Regional Manager. 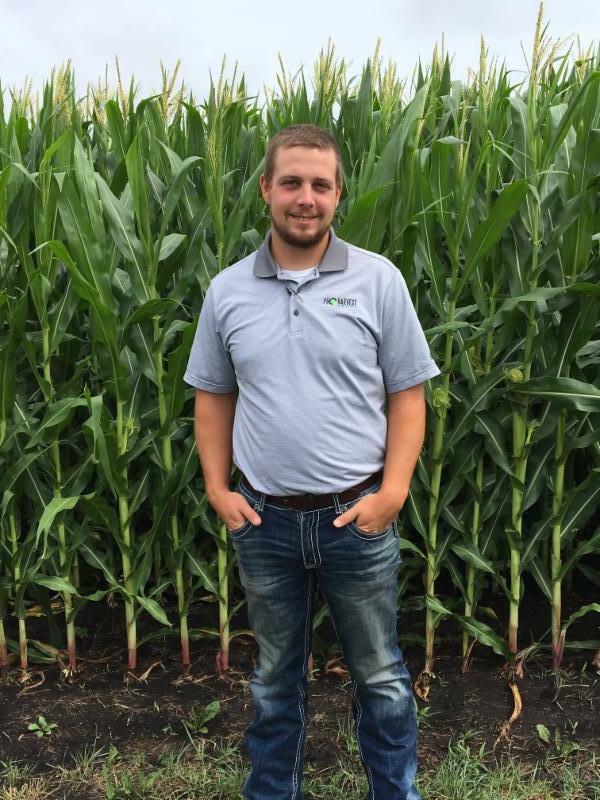 While Trent sells in his local district, his other team members include: Matt Retzlaff, Norfolk, NE; Derald Watson, Grand Island, NE; Craig Neppl, Estherville, IA; Jere Covington, Oxford, IA and Jim Dinan, Edgewood, IA. 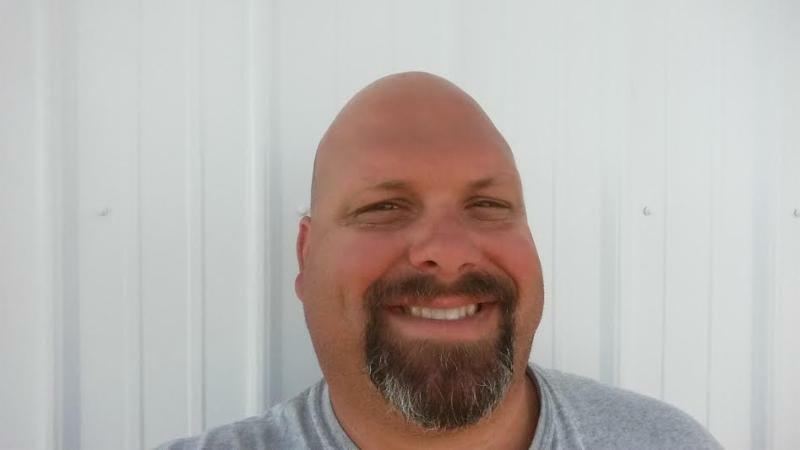 Four Seed Specialists from Illinois will also be joining the ProHarvest sales team including Ronn Dillavou, Aledo; Glenn Wilcoxen, Vermont; Carl Krieg, Centralia and Scott Grosenbach, Oglesby. 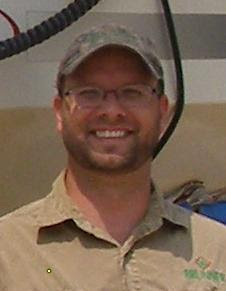 Matthew Reichert from Maria Stein, Ohio will also be joining ProHarvest. 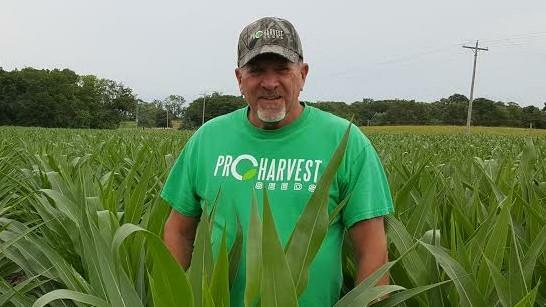 ProHarvest Seeds, Inc., is an independent seed company started in 2010 and owned by veteran seedsman Randy wilken, Lynn Wilken, and Keith Knapp. ProHarvest strives to bring high performance products to its customers in 9 states with an easy-to-do- business with attitude. Additional information about ProHarvest Seeds can be found at www.proharvestseeds.com, or by calling 866-807-7015. Those in the seed industry are getting more questions now than ever before thanks to the various trait options available. Communication is key heading into the 2018 growing season and growers need to have a plan in place before the tractors start rolling. This includes communicating with neighbors regarding what they are planting and the weed control program they will be using. Being an independent company, ProHarvest has access to all of the current seed traits and those traits coming down the road. A large percentage of sales this year consist of Xtend and Liberty Link soybeans. Wilken reports dwindling sales of straight Roundup beans. If you are planting cover crops, Wilken suggests a system approach. Everyone wants that first-year payoff and that isn’t always the case. “It really takes two or three years to really get into that,” said Wilken. With all of the recent talk on weed control, cover crops fit in well since they can help control weeds in a field. Studies have shown less weed pressure in the years following cover crops. Wilken believes those who use cover crops don’t walk away from the practice after a few years. Many farmers in ProHarvest Seeds’ backyard have been blessed with excessive rain for several years now. The area saw its largest corn replant ever but that corn had phenomenal yields in most locations. The crop was better than everyone expected no matter where you were. Rainfall: Have not had any rain in several weeks. Corn:Finally got started with harvest on September 23. Corn yields are much better than expected we have shelled 370 acres so far running about 20 percent to 16 on moisture. Soybeans:Started to cut beans on September 26 have only cut 80 acres have 300 acres ready to cut this week. Yields are also great on soybeans. Rainfall:No rain in Pekin this past week and the hot weather has moved harvest into high gear. Corn:Moisture levels dropping rapidly especially on early hybrids. Yields are a little all over the place depending on location. Ranges are from 170 to 240. Soybeans: A lot of guys harvesting beans with moisture levels as low as 9 or 10 percent. Most everything I'm hearing on yields are in that 60 to 70 bu range. Remember take your time and be safe. Corn: Corn is still progressing but we need more time. I’d say most of the corn in this area is still in the mid to upper 20s for moisture. 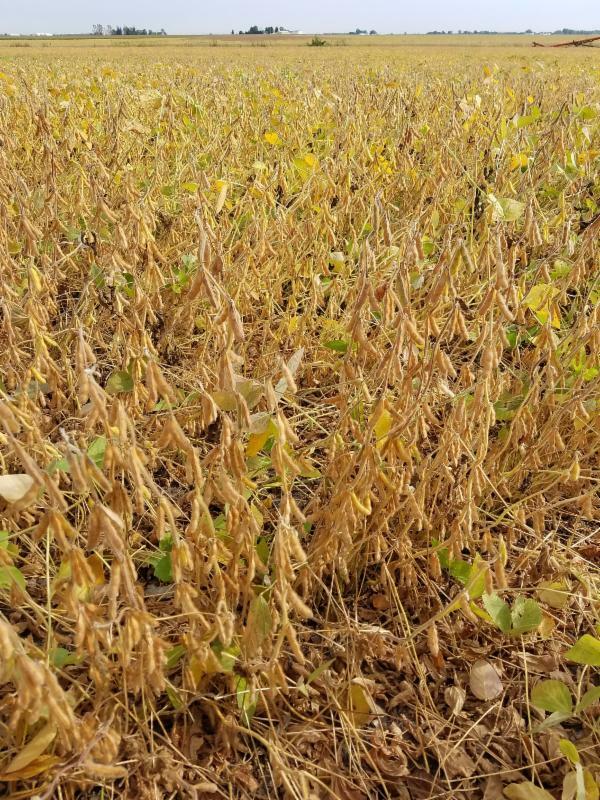 Soybeans:Soybean fields are steadily losing leaves. Most of the soybeans should start coming off later next week. We took some early beans (2871CR2Y) off yesterday. They were 13% and averaged 50 bu/a. We had some white mold which really brought the average down. Rainfall:This week we have had no rainfall, both Corn and Soybeans are drying down quickly. Farmers in Northern Illinois are taking corn and soybeans off. Corn:Corn is still pretty green. Many large acre farmers have begun picking 30-35% moisture corn. Soybeans: Moisture in the Soybeans harvested so far have ranged from 9-12%. Yields have ranged from 40-65 bushels to the acre. Rainfall: We got a little over 2 inches locally last week. It was a nice rain that should help get the cover crops started. Corn:The corn is getting close to ready, I have heard of a couple guys starting and the corn is anywhere from 20-25%. Yields seem to be better than expected so hopefully that trend continues throughout the fall. It appears as though the early season hybrids are going to shine this year. Soybeans:There have been a couple reports of soybeans being harvested, not many are sharing any yields yet, but moisture seems to be 13% on the early season beans that were planted decently early. There are still a decent amount of beans that are still green or just now starting to turn. Cover Crops: Cover crops are pretty much wrapped up for the year with the exception of the rye. As fall starts I would like to wish everyone a safe and happy harvest!! Rainfall: We only received three tenths to a half inch and some places received nothing this last week! My brother came to visit today and he got 4 inches of rain Wednesday Night in the Quad Cities. Corn: We have a few guys trying to run in some corn but still testing 25 to 30 percent through out the field. So still allot are waiting till next week! Hopefully this week in the 90's will help move it along! Soybeans: Soybean are really starting to mature fast now, do have a few guys cutting some 2.2 maturity beans planted in that middle of April time frame, and I've heard close to 70 bu. But can't verify that for sure yet! Cover Crops:We did get all of the cover crop that needed to be flown on by the helicopter Monday and then had this rain, so cover crop is germinated and looking good! Hopefully have some harvest data for you next week! Everyone have a safe and happy ProHarvest!!!!! Rainfall:1.7 inches of rain in Pekin this week. Corn:Corn a few guys taking out some corn. Mid to upper 20s moisture. Yields depend on where you are located. I've heard as low as 165 dry up to 230 dry. Beans are maturing rapidly and many will get harvested before any corn this year. Yield numbers are from 50 to 70. Again location means everything. Rainfall: We have been getting, much needed, highs in the 80’s this week. It’s been too cool the later parts of summer. We’ve had about 3/4 of an inch of rain in the last week. Corn: The warmer temps have really pushed the corn along. There was plenty of corn in the area that hadn’t dented a week ago and is well into the process now. Silage corn is coming off rapidly. We did some silage tests over the last week and moistures were coming in from 68-73%. Tonnage numbers are down, as expected due to the shorter corn heights and unevenness throughout the fields. Another week of nice weather would go along way to easing the minds of many growers in our neck of the woods and to the north. Soybeans: The leaves are starting to drop! Many earlier varieties are really shedding leaves, while the full season varieties are taking advantage of the warm sunny weather to fill the top pods. No record breaking yields being predicted this year. Rainfall:West of i39, farms received up to a half inch of rain. East of i39 received little to no rainfall. Corn:Corn is drying down quickly with the 90° weather we are having this week. Fuller season Hybrids and later varieties could really use a drink to add some last minute test weight. Soybeans: Have had a solid week of dry 90 degree weather here in northern Illinois drying down early soybean varieties rapidly. Farmers who planted early group 2's in mid April have began taking crop off. Cover Crop: Aerial applicators are busy flying on cover crop. Cover crops need rain especially already being 2 weeks behind. A popular mix from ProHarvest that customers are really drawn to is "Quick Cover", which is an 85% blend of Oats and 15% Radish. They view oats being a significant source to help suppress weeds and prevent soil erosion. Radishes gains their popularity from its impressive tap root tap, which alleviates soil compaction, and ultimately leading to increased soil tilth and improved drainage. This Week- Farmers are preparing grain sites and gearing up their farm equipment for the upcoming 2017 Fall Harvest. Rainfall: We have received no rainfall this week, but a very heavy dew and fog on thursday morning. Corn: Most of the corn is starting to fire up and die down, most places still have a couple weeks before they get going full speed harvesting. Soybeans: The beans are starting to turn and some earlier varieties are starting to drop leaves, some guys who got in early with an early variety may start next week, but again i think a couple weeks before anybody gets too crazy. Corn: Corn is hand testing 21 to 30 percent in moisture. I plan to shell a couple semi truck loads on Monday and maybe it will be dry enough to start putting in the grain bin. Soybeans: Soybeans are being cut with moisture around 13 percent. However they have a lot of butter beans mixed in with them. Yields are being kept secret for now. Rainfall:This weeks weather in Northern Illinois has been very nice! We have had warm weather with no rain fall. Corn: Corn is moving along nicely with some Hybrids still about a month out from harvesting. Soybeans: Soybeans are looking healthy and are beginning to change color. Leaves are dropping on mid group 2's and early group 2's are harvested already here in Northern Illinois. Farmers enjoyed their time at the Sandwich Fair, which was ongoing through this past weekend. We are gearing up for harvest and are looking forward to what this years crop has in store for us! Rainfall:Just a trace of rain in pekin this past week. Corn:Corn is slooooowly progressing the cooler weather has corn slowed way down. A few guys have tried some but most everything I've heard locally is still above 30% moisture. The warmer weather prediction for next week should help the moisture levels to start trending down a little quicker. Soybeans:Beans are turning rapidly and I anticipate seeing a few guy cutting select fields next week. Most beans seem to be podded pretty well and I'm hoping for some decent yields. Corn: Corn is starting to turn in most areas. Corn harvesting has started south and west of Springfield. 8312 and 8244 are looking very good. With the heat that is coming into central Illinois that should speed up progress and will start to see many more growers starting harvest at the end of next week. Rainfall: We haven’t had any significant rainfall over the last week. Last week was cool with highs in the 60s, this week we have reached the 80s almost everyday since Sunday with lows in the 50s. Bringing us heavy dew most mornings. Corn: Corn is pushing right along. The early planted fields have brown husk while the later planted (majority) of the Wisconsin crop has just started denting. Silage corn is just starting to be chopped, if the weather holds there will be a lot of acres coming off in the next week. Soybeans: Pods are filling well. Yellow spots showing up across every field. I wish this was just a result of maturity but a fair amount of the color change is disease related. SDS has not been an issue this far north in the past, but there is a significant amount of it showing up this year. I think yields will be all over the board. Rainfall: No rainfall for the last three weeks. Great for drying corn, but horrible on beans trying to finish up. Temperatures are relatively cool still, but beginning to rise back up slowly. Corn:Corn is drying fast. Lot’s of fields in the low 20’s for moisture, some in the teens. Corn yields are very good. 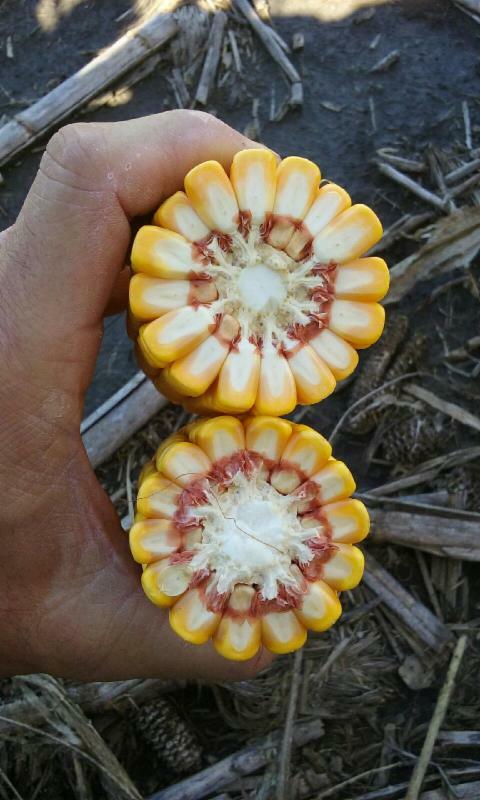 Reports from Barton Co. of dryland corn 220-230 bushel range with irrigated going 260-280. Lot’s of corn in Lafayette Co. in the 200+ bushel range. Even dryland corn (4255 conventional) in Pettis Co., which used to grow a lot of milo, is running in the 160-170 range. Soybeans:Soybeans are turning fast, some from SDS, some from drought and some are actually maturing.SDS spread has stopped. No other appreciable diseases or insects present. Other: Aerial application of cover crops has dropped off due to dry conditions, and the fact that corn is coming out rapidly and rye can be drilled in a timely manner. Early Group V that needs a lot of rain to finish off those pods. Rainfall: We have received no rainfall this past week in the Ashkum or surrounding areas. Corn:The corn is still coming along nicely, but we do still need quite a bit of heat to help the later season hybrids finish out. From what I have seen so far, the early season corn seems to have the upper hand this year due to the weather that we have been having. Soybeans: The earlier season beans are just now starting to turn, but they do seem to be turning faster than expected, it would be nice to get one more good shower to help the beans that have not started turning fill out. There are some isolated pockets of SDS but overall the beans are pretty healthy this year. Other:Cover Crop application seems to be getting into full swing now, lots of planes flying the last couple days, that rain would be nice to help get those going too. Rainfall: Monday afternoon we missed a nice rain on the whole farm. I hand tested some 111 day corn today and it tested 27 percent moisture. So we will have to wait a little awhile longer. Soybeans:Some April planted soybeans are really turning dropping a lot of its leaves. Some farmers are shelling some spots in their corn fields to get some lime stockpiled. The heat of summer has gone and the cool September weather has moved come. Northern Illinois has received no rain this week. The weather this week has been cool and breezy with day time temperatures reaching 70 degrees and at night dropping as low as 45 degrees. -We are hoping for a hot September. Rainfall:This past weekend Hinckley Illinois got hit with a microburst, it brought rain and golf ball sized hail. This storm did not level any fields, however it sheared corn leafs and beat the beans up pretty bad. Corn: Agrinetics Seed Service placed ProHarvest Hybrids in Hinckley- Big Rock's FFA plot, (which also got hit by the same storm.) I walked the plot a couple days later to see just how bad the damage was. I walked ProHarvests 110 day (8074) and 113 day (8312) where I found almost all the leafs torn with holes from the hail storm. The plot got shredded but I was impressed at how big and how far along ProHarvest hybrids were. 8074 and 8312 still looked pretty dang good in the plot considering all the hail damage. They were standing strong and tall. I am looking forward to the yield results! Soybeans: Soybeans in Northern Illinois look healthy, beans are packing test weight. Early maturity soybean fields are turning more yellow with each day. This week farmers are busy preparing for harvest and getting their equipment dialed in for the forecasted "late harvest". Many farm families plan to visit the Sandwich Fair this weekend. Rainfall:We did not receive any rain this last week! Corn:Corn is slowly progressing in this cooler conditions, stalks are still green, but husks are turning brown on the early hybrids! Looks like we are a week or 2 from black layer, and still aways from starting harvest! Soybean: Beans are still green, but the the rain last week are really helping them fill out, the pods have doubled in size from 2 weeks ago. Did have some late blooms abort because of dry weather. But all in all everything is looking good, but progressing slow. Rainfall:No rain this past week in Pekin. Corn: So far I have not seen anybody picking corn or combining beans. Soybeans:A lot of beans turning or beginning to get that yellow cast. Talked to quite a few guys this week and most feel we are still 10 days to 2 weeks from getting started. Really not a lot to comment on this week, just a waiting game now. The only thing I would like to stress as we get rolling and start putting in those longer hours is: PLEASE be safe this fall. Wishing each and every one of you a good harvest season! Corn:Corn is starting to turn in some of the southern areas. Corn harvesting has started south of Springfield. 8312 and 8244 are looking very good. Soybeans:Soybeans are coming along fine, Starting to see some yellow tint in some fields. Also starting to see some Sudden Death Syndrome in a few fields in Western Illinois. Rainfall: We have received a few showers this week, none seemed to be more than a tenth or two. Corn:Corn is starting to dent and guys are starting to be able to tell kernel depth and other key yield factors. Corn is still very green and we are about 250 GDUs behind normal. Soybeans: The beans are loving the nice rains we have been getting but it is a little cool for their liking. We could use some heat to really move them along, some of the early season beans are just now starting to get a yellow tinge to them. Rainfall: On Monday evening it rained a total of of .2 tenths. Corn:Corn is starting to black layer and turning more brown each day. Yields will be variable depending on soil type this year. Soybeans:Soybeans are still lush and green and some of the early planted fields are starting to turn. Rainfall:Northern Illinois weather has been warmer during day and night vs. last week. Last week was cooler during the day and at night got chilly. This week has brought foggy mornings, hot and humid day time temps, and warm weather during night time hours. Rain showers received in Northern Illinois this week have been scattered. Reported rainfall for our area has been 0.0-0.5". Corn: Corn kernels are continuing to dent here in Dekalb County with kernel milk making its way towards the cob. Northern Illinois fields have plenty of water and are enjoying this weeks warm weather which will help the crops flourish till the finish. 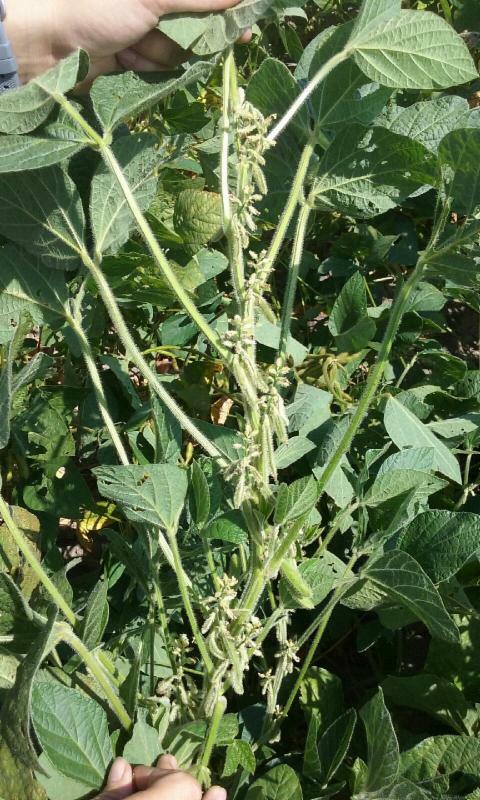 Soybeans: Soybeans planted during ideal seed bed conditions grew tall and stacked lots of pods on the way with exceptional node placement/ spacing. ProHarvest varieties flexed their muscles this year, standing up to the rain showers and wet spring planting conditions. Cover Crop: Farmers utilizing ProHarvests Cover 365- yield strategy will soon reap their increased bushels In The Field, at harvest. ProHarvest cover crops Improve soil structure, lessen soil compaction, suppress weeds, reduces soil compaction, and my personal favorite.. scavenge Nutrients. Improve your soils APH by 10%, let's get started today on your tailored 365-day yield strategy. -Let's break those yield barriers down together! ProHarvest Seeds is dedicated to bringing growers the newest genetics, the most elite trait packages, and the highest pedigree of seed treatments available on the market. I enjoy talking with and learning from, ProHarvest knowledgeable and dedicated team. Have a great Labor Day weekend everyone, I will see you In The Field. Rainfall:We received a half inch, to 1.5 inches this week across my area! Corn: Corn is still green but most is past dent now, hopefully some heat his weekend will push it along to black layer! Soybean: Soybeans really needed the rain this week to fill pods! Pods were really small till the rain came. Most beans are still all green, just a couple early maturities are starting to turn yellow, but most should see benefits from this week's rain! Corn: Corn is coming along nicely, some has black layered most of the rest is very close. Two of our new releases look really promising for my territory and a limited release double pro from last year looks terrific. In addition 8312 and 8244 once again look pretty darn good. Soybeans:Soybeans are filling upper pods thanks to that "state fair" rain a couple weeks ago. I am starting to see SDS and white mold showing up in many fields. Doesn't seem to matter who's seed it is, however, I think in most cases the beans are far enough along yields reductions will be minimal. Corn: Corn is turning quickly. Most early planted corn is past black layer. Some ears have begun to tip. Yields will be above average, with good kernel depth and quality. ProHarvest 8388 ear length is easily seen with many ears in excess of 10” . 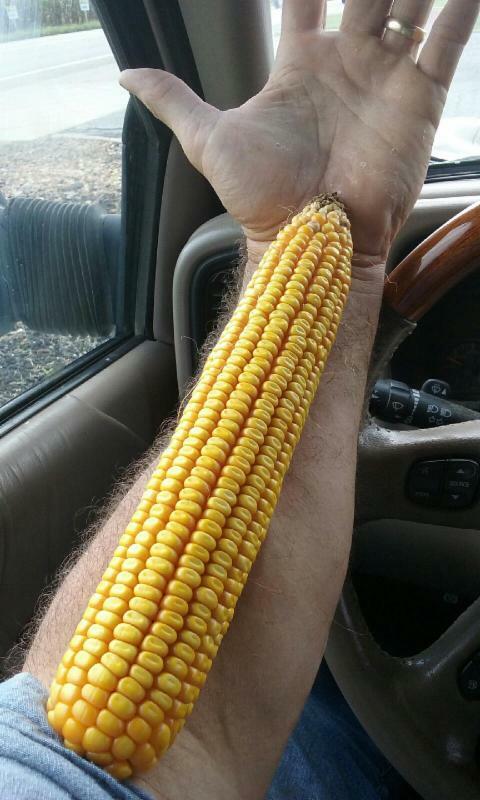 ProHarvest 8312 ear girth really stands out with many ears having 18-20 rows around. ProHarvest 8522 ears don’t look as impressive, until you break them open and see how small the cob is! Soybeans: Soybeans are really feeling the heat from SDS. It’s hard to find a bean field that doesn’t have SDS to some extent. Bean leaf beetles, loopers and stinkbugs are easily found in soybeans, but almost always at sub economic levels. ProHarvest 8312 cross section vs. competitor cross section, adjacent rows. ProHarvest 8388 vs my forearm. Rainfall: This past week we had anywhere from 1-4 inches of rain, however it was a steady rain that soaked in. It was very welcomed. Corn: The corn is still coming along nicely, there are fields every once in a while that are starting to turn but for the most part it's all pretty green. Everything I have heard from people who have tested corn, is that it is somewhere around 40-45% moisture yet. Soybeans:The rain that we received really helped the beans, and I think we're having a great bean making august. The aphid problem seems to have pretty much subsided, however scouting for them is never a bad idea. I have also seen multiple fields with pretty significant Sudden Death. The beans are still all green with not much turning yet, looks like it is going to be a late harvest this year. Rainfall: This week has sure been a pleasant one! On Monday night we received one inch of rain on the farm. The rain came down nice and slow. Corn: Corn continues to mature with a lot of early numbers showing there age. Soybeans: Soybeans have so good pods counts but we never can tell what yield we will have until we harvest. The soybeans are really tall on me they are up to my chest on many of the fields. Other: Have not seen much insect pressure but have a lot of moths around the house. Rainfall: had a good 2 inches of rain earlier in the week. Should be enough moisture to carry us through to harvest. Corn: Corn is looking very good. Not seeing much in the way of diseases in insect pressure. Soybeans: The majority of soybeans are looking very good. Hard to tell at this point where yields will be. Seeing some new growth on the soybeans from the recent rains which add to their yield potential. Rainfall:Northern Illinois, on average, received 0.5- 1 inches of rain this week. The storms that rolled through our area brought lightning and thunder. Northern Illinois is fortunate to have received these showers, the crops responded nicely. Throughout the week weather has been warm and clear with sunshine. At night temperatures dropped as low as 45-50 degrees fahrenheit. Corn: Corn kernels have dented in most fields. Kernel milk layer started its 6-8 week trip towards the cob (center of plant) - ultimately reaching black layer. Soybeans: Soybeans look healthy and responded strongly to the rainfall Northern Illinois received. ProHarvests variety 2827x has a medium height, medium bush plant structure with fantastic node placement. ProHarvests variety 2827x (2.8rm) is a hero in the field with proven genetics. Cover Crops: Cover Crops are a few weeks away. 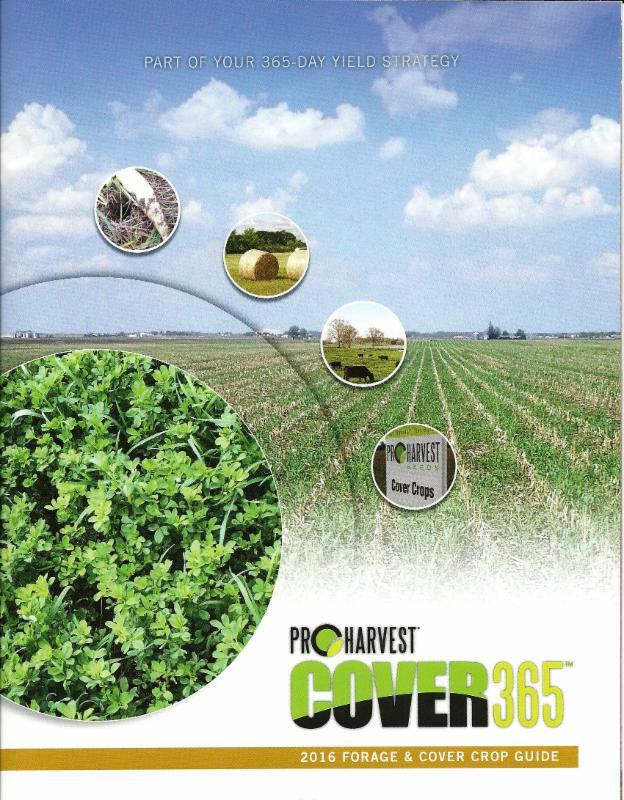 Farmers implementing ProHarvests Cover-365 strategy into their farming operation are excited to reap all the added benefits when planting their ProHarvest Cover Crops. Farmers who want to break those yield barriers are realizing how valuable ProHarvest Cover-365 is when implemented in their own farming operation. Rainfall:Finally a little rain in Pekin but all totaled only about 4 tenths of an inch. Corn: Corn is basically a waiting game now. Cooler temps and less heat units will slow down the dry down. Some estimates are guys hoping to be in the field by Sept 15 -20. I personally don't think many will be running by then. Soybeans: Beans look good and area's that received a decent rain should see yield bump from the moisture. I certainly wish each of you a good harvest season and please be safe. Rainfall: We have gotten a 1-4 tenths of rain over the past two days, it was welcomed and we would welcome more. Corn: The ears continue to fill out nicely and look very good, however the stand counts are just too low to have much over an average crop. Getting some rainfall and working on kernel depth the next month will be key to higher yields. Soybeans: It is hard to tell what soybeans will yield until you get in the combine, however the beans look much more promising than they did early on. Again, getting some more rain and making sure the plants don't abort will be key. Overall the beans look really good. Other: I've found soybean aphids in our plot yesterday that were not present earlier in the week so guys should be scouting and spraying for them when they are at threshold because of the yield damage they can do. It looks like we are gearing up to be a later fall this year. Rainfall: We had .3 tenths of rain last night. Corn: Corn still looks green and all of the corn is now dented but far from reaching black layer. Soybeans: Soybeans are at late R3 and early R4. The are tall and look great. We have around 60 pods per plant and are still setting new pods. Rainfall: We finally got the showers we were waiting for. We were blessed with 2.5” of rain overnight. Temperatures have been just below average but look to pick up heading into the weekend. The extended forecast has the highs in the low 80’s and the lows around 60. Weather is shaping up nicely to finish the season. Hopefully this reflects in the yields. Corn: The corn crop is looking good. Minimal disease and insect pressures throughout this growing season have been a pleasant surprise. Most corn is in the R3 – R4 growth stage, with some earlier varieties starting to dent. Yields should be good in this area. Soybeans: Soybeans are in the R4 – R5 growth stage. This last rain should finish out the season for the beans. Rainfall:Very little precipitation in the past week. We are over an inch behind in rainfall for the month of August. Corn: Corn is still looking good in most areas. South of Springfield there are areas that are starting to show some firing above the ear. Soybeans: Soybeans look great but need one more rain event to help them finish with good yields. Starting to see signs of soybean aphids. Need to keep an eye on them as their population can explode in just a couple of days. Rainfall:Over this past weekend and into the week we have received no rainfall. Wednesday, (today) rain began to drop at 3:30p.m, in Hinckley, Illinois. Rain and thunderstorms should continue early into Thursday morning. Soybeans:ProHarvest Soybeans are putting pods on like crazy and look very healthy -So much vigor these soybeans have! There are many different varieties of soybeans out there that look great, but a couple that caught my eye were ProHarvests 2.4rm Xtend soybean (2427 X) and ProHarvests 2.8rm RR2Y soybean (2871RR2Y) - 2871 is a proven winner year after year delivering consistent yields across Northern Illinois. Northern Illinois Corn and Soybean fields are looking healthy. I began the week scouting fields, doing stand counts, and estimating potential yields for the upcoming harvest. I hope you enjoyed my weekly crop update, I had fun writing it! Rainfall: We had .3-1.2' of ran last friday morning and mother nature has turned dry since then. Temperatures have been cooler this weeks than in past few weeks. Corn: Corn coming along in our area. Milk line is slowly working its way across the kernel. There has been tip back in many of the fields we have looked at. Heat and stress around pollination time was not good on the crop. Soybeans: Majority of the beans still seem very short or behind in our area. Weeds are becoming more noticeable in fields as summer goes by. Japanese Beetles have came and are mostly gone in our area. Clay hillsides are turning yellow from high heat stress and low water holding capacity in soils. Rainfall: Had a small shower on Wednesday but did not register in rain gauge. But not showing any stress due to lack of rain! Corn:Corn is filling kernels very well, should be adding good size to them! Soybeans:Soybeans are looking Good except for the waterhemp is really starting to show its ugly little head now most everywhere over the beans! Rainfall: 0 rain in Pekin again this week. Been about 22 days since our last measurable rain. Corn: Corn wise, we've slowed down a little just due to cooler temps. Yield estimates are quite variable but I think we will average between 185-220 depending on location. It appears that it will be at least mid September before we really get harvest rolling. Overall corn health remains good. Soybeans: Beans could use a good rain right now to push the yields up. Overall I think potential looks pretty good on beans but moisture levels remain low and could ultimately limit our top end. Corn: Corn is moving along quickly. Lots of silage coming out. Corn south of 50 Hwy is either brown or turning. Could be some shelled before the end of the month. 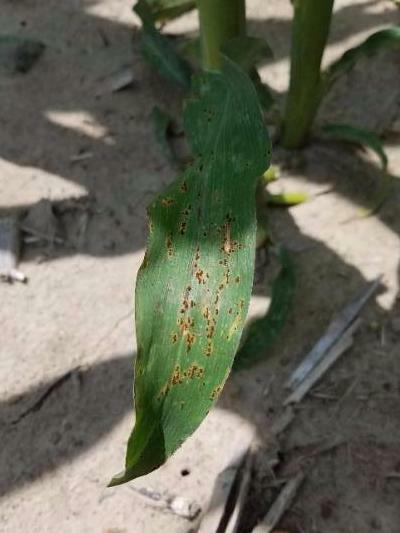 Southern rust is spreading fast, but most corn is maturing ahead of it’s damage. Soybeans: SDS in beans is becoming more visible. Insects are not a problem right now. 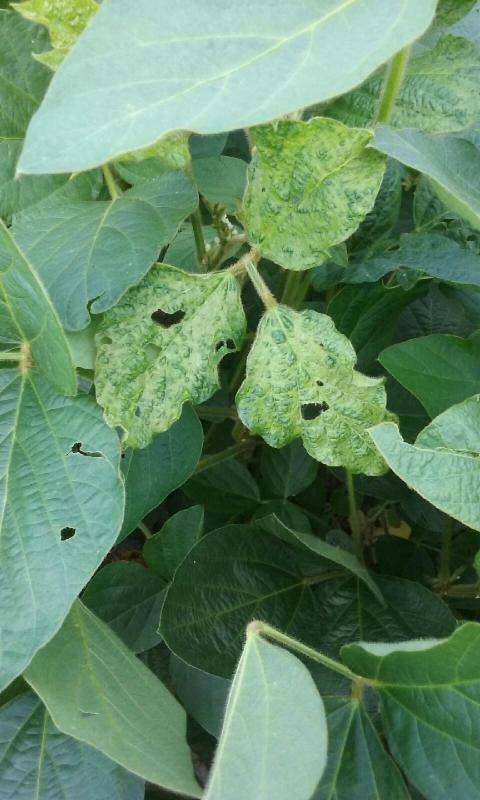 Other: Here are a few pictures of what I’m seeing in soybean fields this week. One is bean pod mottle virus, one is SDS and one is just a picture of some impressive terminal racemes. Rainfall: We have not gotten any rainfall this week but some nice showers last week and some very heavy dews have left us in really good shape. Corn: The corn is filling ears and doing so nicely, most of the ears that I have looked at are 16-18 around and pretty long, seems like kernel depth will be the biggest yield factor this year. There continues to be planes and helicopters spraying all over the place. Soybeans: We all know august makes the bean crop, and so far this august has been about perfect. The beans are still growing nicely and starting to set pods, there seems to be another flush of weeds coming through so some people have started walking some trouble spots trying to get ahead for next year. Overall I think we'll have a pretty solid bean crop. Rainfall: We didn't receive any more rain this week, but we still have nice temperature's. Soybeans: Soybeans have nice height to them but we would love to get another rain to start filling pods. Rainfall: We were on our 2nd week of no rain till last night we had 4 tenths. Corn: Corn is still green and progressing well, could use some rain to fill kernels out. Soybeans: Soybeans are still looking good, putting pods on and still blooming, everything looking good in my territory! Rainfall : Rainfall has been abundant over the last 2 ½ weeks. The ground has stayed wet continuously and we have seen some significant flooding and erosion. Temperatures have been mild, mid 80’s during the day and 50’s and 60’s at night. Corn: Corn is going to be well above average this year. Plant health is good right now. GLS is easy to find in most corn fields, but is mostly below the ear leaf. Less than 1% leaf area above the ear infected. Southern rust is easy to find mid canopy. It’s already sporulated, so it’s been here a while. Soybeans: Soybeans are growing tall with long internodes. Lodging could be a problem if we get many more storms. Soybeans are clean disease-wise and only minimal insect pressure. Other: Near perfect corn growing weather. We’re not losing hardly any photosynthate to respiration, so I anticipate good kernel depth and test weight. Soybeans seem to be holding on to pods better this year due to minimum stress. First cover crops flown on to standing corn this week. Rainfall: Thursdays seem to be the day for rain here. Last Thursday we had 0.5”-0.75” of rain. Rain is again in the forecast for this Thursday. Highs have been, and look to stay, around the mid-upper 70’s. I’d say we are a little behind the norm for heat units this year. Corn: Majority of the fields are done pollinating while those under less stress and planted timely are in the milk stage (R3). Fortunately disease and insect pressures continue to be minimal. Soybeans: Looking good. Again, insect and disease pressures are holding off. R3-R4 growth stage in most fields. Rainfall: We didn't have any rainfall in my area this week. We actually are now 1 inch behind for the month. Corn: Corn has finished pollination and the silks have turned brown. The ears are filling out really well and most have good size to them. Soybeans: Many soybean fields have closed their rows and the pods are filling out. Could have good yields if we get a little more rain to finish them out. Rainfall:Last week we were expecting rainfall later in the week into the weekend, however the rain dissipated. This week we have had no rainfall thus far and the night time hours have been a lot warmer than last week, which were much cooler. Thursday has a 70% chance of rain for Northern Illinois, the rest of the week looks clear, warm, and sunny. Corn:Corn growth stages range from VT-R2. VT is a critical period of growth for corn and any hail or heavy winds can be detrimental to your crop. R1- (SILKING) One of the most critical stages in determining yield potential. K uptake is complete. N and P uptake are occurring rapidly. Soybeans: Fields I have scouted range anywhere from R1- R5. Most fields are at R4-R5. Fields at R1 were planted late and planted into soil with little moisture making it tough on the beans to prosper. Cover Crops: Farmers have harvested their Oats and Wheat and are running drag lines, spreading, or injecting manure on their harvested ground. After their fertilizer is applied many farmers are planting cover crop to suppress weeds and enrich their soils with crucial nutrients needed for their next growing season. Other:Overall, I think things look really great here in Northern Illinois. Farmers are getting excited for the upcoming harvest and are taking preliminary steps to getting their equipment ready to run. I have been out scouting fields, spot spraying, checking on customers needs, wants, and answering any questions they have. I am enjoying my job here at Agrinetics Seed Service working with new farmers everyday and incorporating ProHarvests 365-Day Yield strategy into their farming operation- which they are VERY impressed by! Rainfall: No precipitation in Pekin going on a little over 2 weeks now. Corn: Corn coming along pretty well. A few pollination issues from heat but overall pretty good pollination. Yields are going to be a little erratic depending on where you're located and planting dates. Corn-: With some of the rain this last week the corn is continuing to even up, the replant corn is about the same height as the first planted, a lot of corn is brown silked now and the pollination appears to have gone well. The ears are pretty good sized, but there are still a lot of wet holes so that will hurt the overall yield, but all in all it seems to be not as bad as everyone thought early on. Rainfall: No rain this week however the temperature is much cooler. Corn: The corn is starting to dent and some fields appear to maturing. 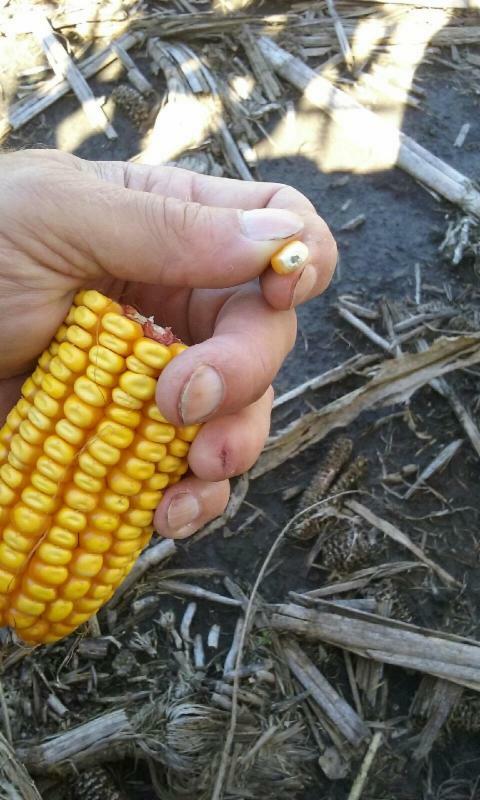 Ear count is higher around 34,000 per acre but do not know what type of weight per ear. Soybeans:Soybeans are full flowered and have seemed to have grown overnight with the rain we received last week. We have had to break out the old weed hooks to clean up some big problem areas with waterhemp. Rainfall: We have had no rain this week but no extreme temps either so everything is looking pretty good! Corn: Corn is filling ears out very well and staying green and intact this week, looking very good! Soybeans: Soybeans are still growing, almost all have now filled the rows in which I did not expect! Pods are coming in and we are still blooming, so looking good for beans also! Soybeans: Soybeans are beginning pod fill. Overall Corn and beans have recovered from the stress and are looking very good. Other: No significant diseases showing up in either corn or beans. Moderate levels of Japanese beetles are hanging on much longer than anticipated. Cool temperatures and good rainfall at pod fill has me concerned about the potential for SDS. Will keep watch over the next few weeks. Rainfall: Not much change from last week. Still waiting on some rain. Sounds like our best chance is Thursday, but we will also see a 20 degree temperature drop, giving us highs in the mid 60’s. Corn:Some corn is still in the pollination process but most of the early season varieties are in the blister stage. Soybeans: Soybeans are in the R2 to R3 stage. Walked an early variety today that is showing some white mold, the beans were chest high in those areas of the field. This particular field was drilled and under irrigation. I don’t believe we would have seen the same symptoms if not for those two factors. We really haven’t had enough rain to warrant a big white mold outbreak in this area. Rainfall: No rainfall this week. Corn:Corn is finishing up with pollination and it looks like pollination went well. Starting to see some Grey leaf spot so we need to be vigilant and watch those fields closely. Corn fields look very good but we need to remember that plant stands are not as good as they have been in past years. The ears are flexing somewhat but it will tough for them to make up for low stand counts. Soybeans: Soybean are doing very well. Many fields have close their rows and have set their pods. Still seeing Japanese beetles working on some soybean fields. Rainfall:We have received no rain this week but are expecting showers later in the week existing into the weekend. Last week we received storms that put some fields under water. There are couple acre drown out spots that have turned brown, but nothing too detrimental.This week we have had good growing conditions. Warm weather during the day and mid 60-70 degrees Fahrenheit at night. Let's talk about what the Corn and Soybeans are doing, shall we? Corn:Depending on planting date I have seen Corn in Dekalb County range from Growth Stage(VT) to (R3). Most fields have all brought on tassles, for the exception of a couple fields that had late replant dates. I have seen Green Snap in some fields but none surpassing economic threshold. Planes are out and applicating fungicides and pesticides. Soybeans: Now, onto Soybeans- Northern Illinois farmers, their soybeans are looking healthy here in Dekalb County and range from Growth Stage V3-R5. ProHarvest Seeds Xtend and RR2Y Soybean Varieties look great in the field. Personally, I am very impressed. Rainfall:No rain in Pekin this past week. Fortunately temps were milder. Corn:Corn crop looks good in some areas and average in other areas. Will be doing yield estimates next week. Soybeans: Beans are setting pods and look good in most area's. We will still need rain to get upper end yields in beans. Waterhemp is starting to show its ugly face above the canopy in a number of fields. We will know more on yields in 2 -3 weeks. Rainfall: we received .2 tenths of rain on the farm, Wednesday night sure was a nice soaker. We had 5.7inches at our main farm shop and I got 2.5 inches at my home at the southern edge of christian country. 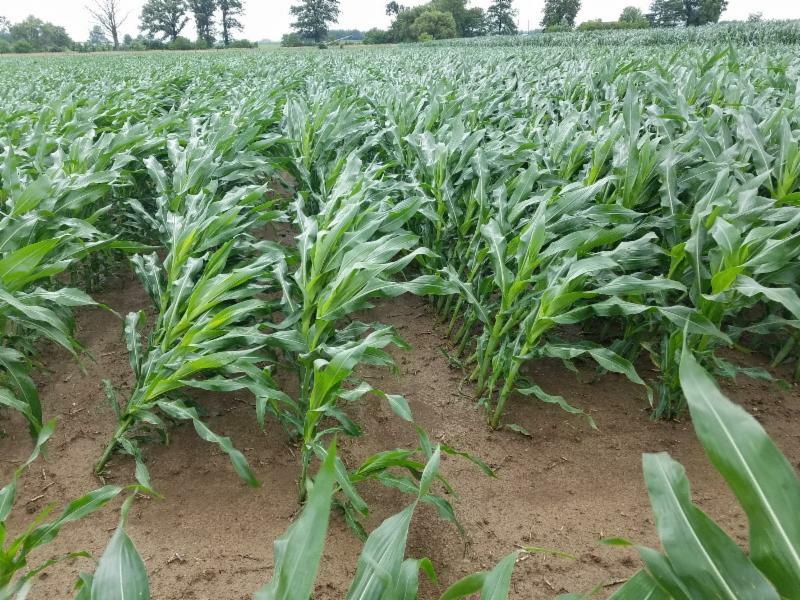 Corn: Overall the corn crop did not show much heat stress; however the the lighter color soil stressed the corn much worst than the heavier soils. Soybeans:Last week was a hot one! Saturday night Soybeans look excellent and didn't seem to mind the heat. Rainfall:Almost a inch of rain Wed night. Much needed in Central Illinois. Corn:Corn appears to have pollinated pretty well. The length and girth are impressive in some fields. Unfortunately we need to remember that stands were reduced in some of these same fields. I am starting to see some grey leaf. It's not bad yet but that could change very quickly. Keep an eye on the disease situation. Soybeans:Beans are blooming and pods are starting to set. Japanese beetles remain quite active in bean fields. If you are at that 25 to 30 percent defoliation you may want to consider your options. Other:Overall I think our crops look pretty good. I will start doing some yield estimates in the next couple of weeks. Cooler weather for a week or so will definitely take a little stress off the crops. Rainfall: We received 3.9 to 5 inches total this week in 5 different days my general area, but as you go south that really drops off, and route 24 south have only had a half inch in the last 6 weeks, so looking a little tough in the southern parts of my Territory. Corn:Corn is all flowered now and pollinated, last of the fungicide was applied this week and things are looking good! Soybeans:Beans are really coming on this week again, most all of them have rows filled in, which I didn't expect, and we are now putting pods on! Seeing a couple yellow spots in wet holes or low spots where a little water stood, but water is gone now and should come out of it. Rainfall: We had 1-2” of rain on Wednesday. That’s the only rain we’ve had in over a week. Despite the lack of rain, crops are looking good. 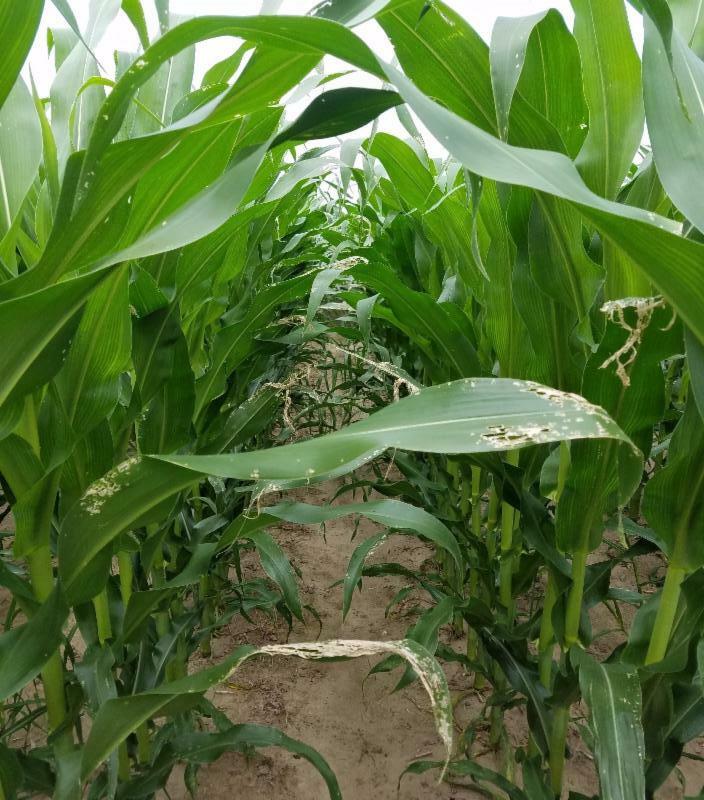 Corn: R1 – R2 everything is silking and pollinating. Other: Just starting to see rootworm beetles in some heavy pressure fields (corn on corn). All other insects seem to be holding off for now. Only a few Japanese beetles here and there. Rainfall:We continued to get rain this week.Both corn and soybean fields look good with deep green color. Corn:Most corn fields are either in pollination or have finished pollination and have brown silks. There are a few fields that are goosed neck from recent storms but they appear to be straightening back up. 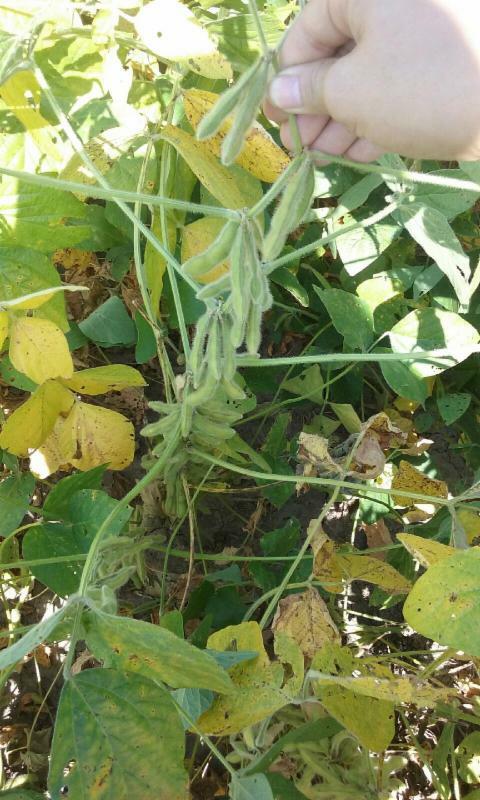 Soybeans:Some soybean fields are finally starting to close their rows, but many fields will continue to have weed control issues in the coming weeks. Rainfall:We received 8 tenths of rain on Sunday night on the farm. Corn:Corn pollination has been very good and has the potential for a high yield. However some of the corn is showing some firing of the lower leaves. Soybeans:Soybeans are still growing but have not started to set any pods. Other:The heat will be very hot this week reaching close to 98 on Saturday. Will have to see if the corn can tolerate that much heat with little rain. Rainfall:Not much rain this week in Pekin. 3/10s in my rain gauge. Guys not that far away had as much as and inch. Corn:Corn for the most part has pollinated and appears to be in pretty good shape. Fortunately the Japanese beetles seem to be staying on the edges and only going a few rows into the fields. 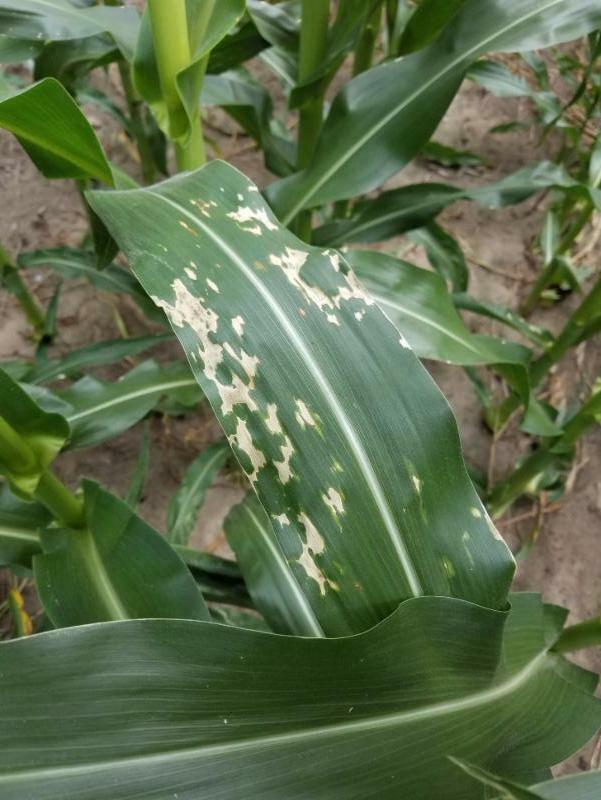 Grey leaf, northern and Gosses will be the next thing we need to watch closely for in corn. Soybeans:Beans have really taken off and are starting to bloom just a little. Japanese beetle populations remain high in many bean fields and we need to continue monitoring them. Other:With the high heat and humidity things can change rapidly in both crops so watch carefully. We will need more moisture soon if the heat doesn't break. Rainfall:Rain has been very spotty this we we have ranged from 2 tenths all the way to 2.1 inches in areas! Corn:Corn is almost all tasseled and close to fully pollinated, except the late planted and replanted areas! Soybeans:Soybeans have really changed and grew alot this week. The heat and rain has really moved them along! Other:Most fungicide got applied to corn, and on some beans this week, should be done with that this next week! Corn:A lot of tassels coming on this week. Soybeans: Soybeans are pretty much in full bloom but still variable depending on planting date. Other:Some spraying and scouting for Japanese Beatles and fungicide applications on both corn and soybeans. High clearance sprayers are out Y-Dropping. Many farmers are out harvesting wheat and are looking forward to integrating cover crops into their farming operation. Rainfaill:There has been a couple spotty showers across West Central IL this week. The rainfall varied from 0.7" to nothing with most areas lacking in rain and hot weather sitting in on us all week. Corn:Corn is approximately 80% pollinated. Planes and helicopters have been spraying Fungicide on Corn. There is a little Grey Leaf Spot is starting to show up in the corn fields, growers need to keep an eye on GLS as we move forward. Soybeans:Majority of the soybeans are R2/R3 stage. Just started to spray fungicide on the beans. Other: To the west of us they have been spraying for Japanese Beetles in corn and Soybeans. Temperatures near 100 degrees all week will sure test these roots on this crop..
Corn- The replant corn continues to catch up to the first planted corn, so the corn fields are evening up and making the fields look a little bit better. Stand counts are in the 29-32,000 range for the most part. Within 4 or 5 miles you can see corn all the way from v5 or v6 to tassel so it varies greatly. Soybeans- With the rain and heat this last week brought locally the beans are really taking off. The rows are finally starting to close up which will continue to help with weed control. Some of the earlier planted beans are going to start flowering in the next week or so. Overall the beans look pretty good. Wheat- The wheat harvest is finished up for the most part. Yield was decent and quality seemed to be pretty good. Corn: Corn has polluted and now has brown silks the corn still has a nice rich green color to it as well. Soybeans: Soybeans are now in R2 growth stage and are finally knee high on me. The soybeans are finally growing and have shaded out the rows. Other: Overall crops look great but we are still dry on most of the farm. Rainfall: Almost 3 inches of rain this week. Corn: Corn is right in middle of pollination in central Illinois. Some area's are still getting hit hard by Japanese beetles. Soybeans:Beans got the drink they needed and seemed to have jumped overnight. Weed control may continue to be an issue as rows still are not canopied. Rainfall: we have had from 1.6 inches to 2.2 inches this week. Corn: most all the corn is in full tassel except the later or replanted corn, but overall looking pretty good! Soybeans: Soybeans are finally growing and flowering, and looking better every day. Other:Japanese beetles are still thick as ever, but luckily still only on edge of bean fields and have not seen much in corn! Rainfall :Rainfall has been scattered this week following high heat for several days. Summer is here with a vengeance. Corn:Adequate soil moisture is helping the corn to take advantage of the heat and move along at a rapid pace. 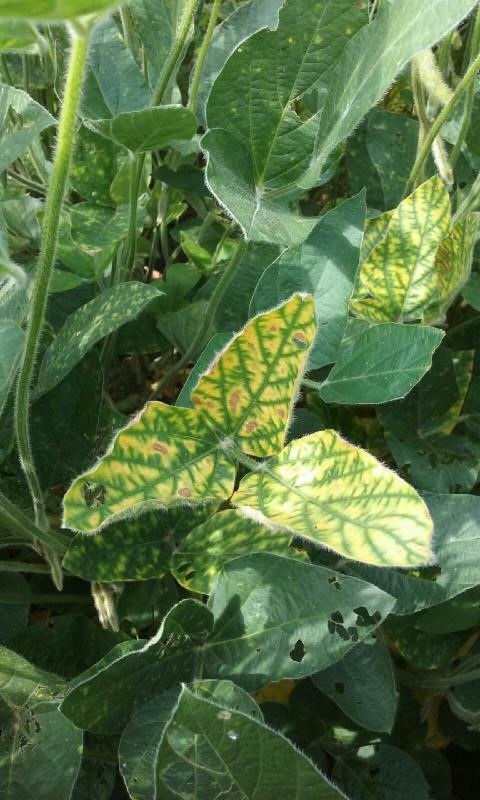 Soybeans:Virtually no foliar diseases in corn or soybeans. Other:Damage reports continue to roll in. Saw one field completely destroyed due to tank contamination that has already been replanted. Labels suspended and then reinstated within a week—who knows where this is going. Japanese Beetles are here in extremely high numbers, but minimal field crop damage as of now. Rainfall: Surrounding areas had anywhere from 0.5” – 4.5” of rain already this week. Our soils tend to be a little on the sandy side right here, we welcome any rain we can get this time of the year. We have been fortunate to miss the more severe weather which has hailed out fields both to our North and South. Corn: Starting to see some tasseling. Temperatures have been perfect and the corn is really starting to stretch out. Other:Currently we aren’t seeing much for insect pressure. Corn:Most fields of corn are starting to tassel or have recently tasseled. 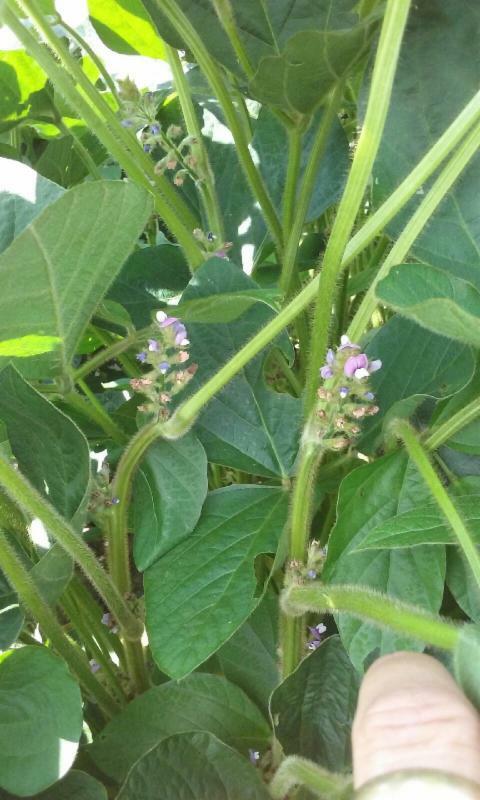 Soybeans:Soybeans are starting to flower so the recent rains will benefit them too. Other: Have seen a few planes spraying fields ,Because many soybean fields will not close their row you will need to watch for weed outbreaks. Rainfall:We received an inch and a half of rain this week and the crops responded nicely. Rainfall: This week has been another wet week in our area, with rain Monday, Tuesday, and Wednesday so far. We have seen anywhere between 1 inch and 3 inches, depending on location. Corn: The corn is highly variable, depending on planting date. The earliest planted fields (April 18-25) are looking very good, and most have tasseled. Some fields are showing variability due to drainage as well. The replant fields are starting to look good, with most having additional nitrogen applied, and plenty of moisture. They are growing very rapidly now, if they don’t have too much standing water. Soybeans: Soybeans are variable depending on planting date as well. Some are flowering and about to canopy, while others are just a few weeks out of the ground. Slow row closure will continue to create weed issues throughout the season. Other: Japanese beetles have been out in full force this year, in both corn and soybean fields. With this hot and humid weather, there are some diseases popping up in most fields. Just a few fields have shown wind damage thus far. For all the benefits corn and soybean growers are seeing associated with Cover Crop applications, the number of acres being planted to Cover Crops continues to rise. At the same time, with more persistent weeds showing tolerance to glyphosate herbicide programs in recent years, another rising trend involves growers adding tank mix partners and other modes of action that provide some residual weed control for their Cash Crops. When these two trends converge, it can be problematic, leaving growers wondering about the effect that any related herbicide residue might have on Cover Crop establishment. In general, most herbicide labels usually include information regarding the restrictions for rotation of crops. However, many of these restrictions do not include Cover Crops. Or, if they do include Cover Crops, they’re probably staged at the very safest time period available—because, when those labels were written, Cover Crops were not overly prevalent in the market. Expert recommendations call for looking at the most current tolerance information, and the plant backed restrictions, to get a good Cover Crop stand establishment. Cover Crops planted for conservation practices allow for greater flexibility, depending on the mix formula and the risk of herbicide interaction. But those planted heavily, as part of a row crop situation, might be limited to that information as well. When it’s clear that a residual herbicide program might impose on a Cover Crop program, the time to develop a plan is in the fall, the preceding year, versus the summer of the year in which the programs will be implemented. This is essential to making certain an herbicide application will provide good weed management to maximize Cash-Crop yield potential, without detracting from the benefits of a Cover Cropping system. For more information, growers can do an Internet search using the keyword phrase: Herbicide Rotation Restrictions in Forage and Cover Cropping Systems. This report, published by the University of Wisconsin, reviews different Cover Crop species against various herbicide programs and their active ingredients, identifying the best choices growers can make to maximize success in terms of both their Cover Crop establishment and preservation of a weed-free environment for their row crop. Because of the benefits corn and soybean growers are seeing associated with Cover Crop applications, the number of acres being planted to Cover Crops continues to rise. Expert recommendations call for looking at the most current tolerance information, and the plant-backed restrictions, to get a good Cover Crop stand establishment. Some may feel the 2016 crop is off and running at a slower than desirable pace with just 66% of the state's corn crop planted. When compared to recent history, we are well beyond the five year average of 38%. This would mimic what I have been hearing across our sales territories from our Seed Specialists. The recent rains and cool weather have slowed recent progress on those numbers but we are in very good shape nonetheless. Our current GDU accumulation is running a little behind schedule, with 440 GDU's accumulated (Normal, IL.). Based on an April 1 start date, we historically would have accumulated 465-475 GDU's. As a reference point, we were running close to 560 during the same time period in 2015. Corn: Soil conditions have been very favorable. As a result, stand uniformity looks really good. While walking fields and doing population counts, it would appear that we avoided any serious issues with emergence or stand establishment. I will note that within certain geographies, there will be limited replant due to heavy rainfall and ponding, but these will be very small percentages of acres. Recent cooler than normal temps have caused some minor yellowing in specific hybrids. These will quickly fade back to a robust green as temperatures return back to normal. Special note- If you happen to have some of the remaining 34% of the corn acres to plant, don't fret, stay the course. While traditional thinking would force you to consider switching crops think about this; in 2009 and 2013, very few acres of corn were planted by the end of April. Both those years the final state yield averages were 10+ bushel over trend line yields. Just remember that the need to plant those acres can't overrule planting when conditions are correct. The rush to plant and creating a poor environment for seed establishment could be twice as costly as any possible loss in yield by waiting an additional day. Soybeans: I have received reports that 10-80% of soybeans are planted across our sales territories, which again falls in line with reported state averages. Those planted fields have been slow to get rolling but seem to be progressing. There have been observations of "purpling" mesocotyls in emerging fields. This would be due to the cold, wet weather we enjoyed last week. Also received a note that the slow to develop seedlings were being stressed by slowed PPO herbicide metabolism in some fields. While undesirable, this is a side effect of our need to maintain good cultural practices and use multiple modes of prevention to control small seeded broadleaves and grass in our fields. Under warmer conditions, we normally don't notice this issue. The plant is developing so rapidly it metabolizes the active ingredient more easily than it is this year. Food for thought- Soybean planting depth. 1.75-2" is considered the ideal planting depth for corn and most growers strive for that planting depth. But what about your soybeans? Many growers I have worked with over the years tend to shallow the planting depth up to 1" +/- depending on planting date and tillage practice. In a multi-year study conducted over various seeding depths and populations researchers found that the greatest yields were achieved at the 1.75" seeding depth no matter what tillage system was used. The finding also concluded that yields drastically declined when planting depth was shallower than 1.25". So just like in corn, make sure you are maintaining the same ideal planting depth to achieve top yields. Wheat: Good progress is being made on wheat development. Growers should be scouting for foliar diseases and ready to make fungicide applications, if warranted, on wheat fields this week as they enter the reproductive stage of development. Stripe Rust and Fusarium Head Blight (Scab) has been observed across the state. The cool wet conditions have been ideal for rust to flourish. If you have fields just beginning to flower, a treatment of Prosaro or Caramba should be considered for control of Scab and Stripe Rust. Contact your local retailer about use of these products. That's all for now, have a safe and productive week. When accounting for the broad range of factors that can affect yield potential, it’s extremely important to evaluate the soil’s micronutrient profile—that mix of seven essential minerals growers can often overlook while making more conventional NPK fertility decisions. Crop production involves 16 basic elements, seven of which are micronutrients—boron, chlorine, copper, iron, manganese, molybdenum and zinc—that all serve specific functions ranging from plant hormone balance to photosynthesis. Most soils are sufficient in these micronutrients, but others, such as more sandy or low organic-matter soils, can show a deficiency. Meanwhile, other fields can appear to have a deficiency if the soil pH is out of balance, affecting micronutrient availability. Many distinct characteristics of micronutrient deficiencies may show in a plant’s physical appearance—most common is chlorosis, or yellowing of the leaves. These deficiencies, however, will not be uniform throughout the field, as they may only occur in certain patches due to variations in soil profiles or properties, drainage, soil salinity and other aspects that can affect availability. Boron: a light chlorotic (yellow) appearance. Chlorine: wilting of younger leaves—rarely seen on crop plants in a field. Copper: a light chlorotic appearance, leaf-tip dieback or leaves twisted due to loss of turgor pressure. Iron: chlorosis between the veins of new leaves. Manganese: very similar to the appearance of an iron deficiency. Molybdenum: chlorosis of young plant material and the oldest plant material. Zinc: stunted growth, reduced internode length—young leaves are much smaller than others in the plant. If any of these signs raise a red flag, gather a grown-plant tissue sample and send it to a trusted, qualified lab for an accurate analysis, as the current herbicide program or the presence of a disease may be the problem instead. If it is, in fact, a micronutrient issue, the best method for replenishing these micronutrients back into the plant is to apply a starter fertilizer to the soil or through a foliar feeding by broadcasting the fertilizer over the top of the crop. Again, soil pH has a role in the availability of micronutrients, much the same way it impacts the core elements of an NPK (nitrogen, phosphorus and potassium) program. If the pH is either too basic or acidic, it can affect the plant’s micronutrient uptake. The optimal pH is between 5.5 and 7.0, and regularly scheduled soil testing is always recommended. Annual ryegrass is an outstanding cover crop for building soil health. The goal is a successful control following the first herbicide application. There are several key factors to keep in mind when it comes to terminating this cover crop. - Allow 5-7 days after annual ryegrass has begun to actively grow before spraying. A good indicator of this is your lawn- if you have not mowed your lawn, it is probably too early to be killing annual ryegrass. "Producers who haven't yet terminated their cover crops should now wait for warmer weather before applying herbicide." Bill Johnson, a Purdue Extension weed scientist says. 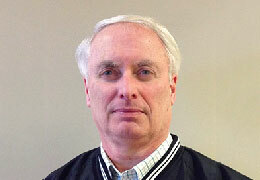 - Click here to read a press release from Purdue extension. - Annual ryegrass escapes can be controlled post emergence with full rates of SelectMax, Poast Plus, or Fusilade DX. After the crop emerges, escapes can be controlled in corn with labeled rates of Accent Q, Steadfast Q, or Option, but best control is obtained with these products when temperatures are above 70 degrees. To optimize corn production, producers should today pay close attention to carbon-to-nitrogen ratio and mineralization, as they manage soil nutrients in the spring and fall. The fall harvest date and the spring’s temperature and moisture levels have a significant impact on the breakdown of crop residue and mineralization, the release of nutrients into the soil. We know that the higher the carbon–nitrogen ratio is, the longer it takes plants to break down. For example, because of their high carbon–nitrogen ratio of 60 pounds of carbon (C) to 1 pound of nitrogen (N), cornstalks break down over a longer time than alfalfa or tillage radish because their C:N ratio is about 17:1 and 19:1 respectively. If we look at three different corn harvest dates—September 1, October 1, and November 1—we’ll discover a significant difference in how well postharvest crop residue breaks down. Given adequate moisture and temperature, we will witness more breakdown in corn residue when it is harvested early in September. Even though corn residue has a high carbon–nitrogen ratio, it will break down, give nutrients back to the soil and be more available. On the other hand, corn harvested in November has a very small window for the breakdown process. In our Midwestern soils, mineralization takes place naturally in the fall and spring. Soil organisms decay cornstalks, for instance. We know that this decomposing influences how fertile the soil is and how well the next crop grows. Yet, soil scientists are still studying the how and why of mineralization. Much is unknown, so we cannot fully predict the effect mineralization has on soil. What we do know is that mineralization requires proper moisture with adequate temperatures. In other words, if the season is too cool—below 50 degrees F—we do not have much biological activity. Therefore, we have very minimal to no mineralization. Once temperatures rise above 50 degrees F and the weather provides adequate moisture, the mineralization in our soils increase. As a result, the soils gain more organic nitrogen, which has a direct relationship in helping to break down plant residue. Looking at the extended fall we just experienced in 2015, we had more mineralization and improved breakdown of plant residue. This current spring is our next opportunity to break down crop residue. The decomposing process during the springs of 2014 and 2015 was poor. We had cool springs with saturated soils, which resulted in delayed mineralization because corn residue with a high C:N ratio did not break down well ahead of planting spring crops. This year we’re seeing the exact opposite. The Midwest had a very mild winter after a long extended fall with a fairly early harvest. In both seasons, the breakdown of high carbon-to-nitrogen crops went well. The spring of 2016 has arrived early and has provided some variability. In many cases, it’s a mixed bag in the Midwest, with both wet and dry soils depending on your area. Even in those areas that have had adequate moisture, we’re certainly seeing the start of mineralization two to four weeks earlier than normal, which will provide a flush of nutrients for our 2016 cash crops. Likewise, in the areas that have warm and dry temperatures with not much moisture, we are going to see minimal mineralization, which may not adequately break down crop residues, resulting in fewer nutrients available in the spring. When we begin to monitor our plan to ensure adequate nutrients for maximum production of our cash crops, we must consider the fall’s harvest date and the spring’s temperature and moisture levels, along with efficient crop-residue decay, our crop’s C:N ratio and mineralization success. Drones: Are They Worth the Hype? When is innovation just high-tech hoopla, and when does it have a real place on the farm? That’s the question many growers are pondering with the rise of the agricultural drone—a device that, while intriguing, leaves many wondering how they could really put one to productive use in an ag operation. But, before dismissing the notion, growers ought to consider the data. In one study, for example, conducted by Informa Economics and Measure (Des Moines Register, July 21, 2015), researchers projected that, through the use of drones, corn, soybean and wheat farmers could gain $1.3 billion a year in both input savings and yield increases. They calculated per-acre savings in the neighborhood of $11.50 for corn, $2.50 for wheat and $2.25 for beans, with yield increases of about 3.3% for wheat and 2.5% for corn and beans. For a machine with a one-time cost as low as $1,200 (and declining), that’s some impressive ROI potential. A drone can go as far as a grower’s ingenuity can take it, and they’ll soon become a tool as valuable as any, especially for operations with more than a thousand acres. More quickly and thoroughly scout fields for insect and disease pressures and, then, subsequently make a spot-spray application. Monitor crop health throughout the season. Look for tile and drainage problems. Assess storm damage, not just of crops, but also atop barns, silos and other tall structures. Fly over irrigation pivot systems. Examine cattle health, via an infrared camera that can detect fever temperatures. — and the possibilities go on. Some have even used their drones to patrol their acres looking for hunters and other trespassers. It’s no wonder that experts predict 80% of the commercial drone market will eventually go to the agricultural industry. As of this year, all drones are to be registered with the Federal Aviation Administration (FAA). Drone owners and operators must have a copy of their license on their person or in the flight bag any time the device is in use out over the field. Finally, drones must remain within the operator’s line of sight and are not to fly any higher than 400 feet—which is certainly high enough to fulfill any of the operations listed above, and more. Apart from having productivity goals that extend beyond a single season, 365-day yield strategies to increase APH are also characterized by multiple, sometimes subtle, decisions that, collectively, expand yield potential. As growers refine their hybrid packages for 2016, one of the understated factors worth considering involves the process of selecting ear type and leaf orientation based on soil characteristics. Ground historically known for lower productivity, due to the likes of drought stress or poor organic matter, are often best served with a flex-ear hybrid that also produces an open-architecture or pendulum leaf structure. 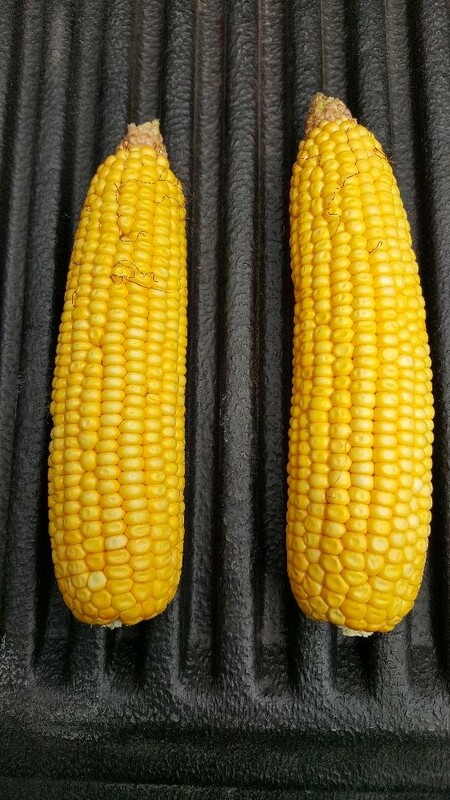 While poised to be longer and skinnier with fewer kernel rows, flex ears have the ability to add kernel rows, girth and length, depending on the growing environment. That’s why an open-architecture leaf can provide a valuable early-season advantage, particularly in drier soils, because the open, almost flat orientation captures more sunlight and provides the shade to retain as much soil moisture as possible. This is especially key when recommended plant populations for these types of hybrids are usually 3,000 to 5,000 off the Corn Belt’s 33,000- to 34,000-ppa average. Marrying a semi-flex ear with a semi-upright leaf orientation allows for more crowding of plants to achieve a higher population, planted in 30-inch rows or narrower, effectively creating that canopy to limit sunlight breaking through to the soil. Hybrids with these characteristics have the ability to go across a wide variety of soil types and are ideal candidates for variable-rate seeding, because they do have that ability to flex the ear in good productivity conditions. Yet, they won’t take a yield hit when under stress or at a lower population where they can retain some of that ear size. To optimize soils with a higher level of organic matter and a higher CEC content that makes more nutrients available, the obvious approach is to get as many ears on that ground as possible and support them with a more aggressive nitrogen plan. That being the case, hybrid selection ought to lean toward a determinant ear with an upright leaf orientation conducive to populations approaching 38,000 ppa. The dense planting alleviates the need for an open, leafy canopy and the fixed ear sizing preserves valuable stock integrity and late-season intactness that can otherwise be sabotaged when a hybrid puts on more ear than it can handle under good conditions, a full growing season gets dry or the plant’s nutrient supply runs low. Leveraging this hybrid-selection knowledge with variable-rate planting equipment—especially the latest in multi-hybrid planters—takes yield potential to an even higher level. Growers can plant, say, a flex-eared hybrid on a clay knob, lower the population and use an open-architecture leaf to harvest sunshine and minimize soil drying. Then, proceeding across the terrain, a low lying area can call for an upright-oriented hybrid that pushes populations in a semi-determinant or determinant-style ear to maximize yield.